Having spent ten episodes gradually introducing new viewers to the essentials of the Doctor Who legend (that the Doctor is a centuries-old alien, that his ship can travel through space and time, that his arch enemies are the Daleks, etc) and acquainting die-hard fans with the show's new mythology (that the Doctor is the last of his race, his home planet having been destroyed in the last great Time War against the Daleks), writer/executive producer Russell T Davies evidently felt that the time was right for the programme to begin revelling in its own folklore. 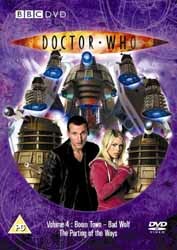 As Boom Town begins, exposition is rattled out at a rate we haven't witnessed since the 1996 TV movie, with the Doctor (Christopher Eccleston) and Rose (Billie Piper) explaining to Mickey (Noel Clarke) why the TARDIS resembles a police box. There's a slight dig at the TV movie when Rose uses the Eighth Doctor's phrase "cloaking device" and the Ninth Doctor corrects her by using the term established in Logopolis: "chameleon circuit". Fans who are so inclined are at liberty to assume that the TARDIS' need to refuel is due to the absence of Gallifrey, which used to power all Time Lord vessels via the Eye of Harmony. However, Davies is also keen to prove that the new show has as vibrant a mythology as the old one, and this episode is a demonstration of how many pieces he has already set up on the board. Aside from the return of Mickey, we revisit the site of the Rift, last seen in The Unquiet Dead, and encounter the first returning monster of the new era, the Slitheen known as Margaret Blaine (Annette Badland). The writer also draws attention to the words "bad wolf", which have been following the Doctor and Rose throughout their travels. This and the next two instalments in the series are all about consequences. As Margaret observes, the Doctor isn't used to hanging around to witness the aftermath of his actions, but with the TARDIS grounded, he is suddenly forced to do just that. I'm not sure what is more remarkable about this character-driven episode: the fact that Davies and Badland succeed in making me feel sorry for a Slitheen, or the fact that Davies and Clarke manage to make me feel sympathetic towards Mickey Smith. I hated Mickey when he was introduced in the episode Rose, considering him to be a shallow and unbelievable character, present solely to provide cheap comic relief, and not even very good at that. However, watching this episode, I entirely agree that he is mistreated by Rose, who steps in and out of his life, expecting his continual devotion but demonstrating no fidelity on her own part. Apart from the usual minor RTD plot holes (such as why doesn't Margaret activate her teleport device when she's in her office rather than climbing out of the window first) and the revelation of the Daleks during the teaser for the next instalment (shouldn't have done that), there is little to fault this episode. Bad Wolf and The Parting of the Ways continue Russell T Davies' well-deserved celebration of his new mythology, bringing together elements that have been introduced throughout the preceding season, including the Satellite 5 station from The Long Game, the extrapolator from Boom Town, the Daleks, Mickey Smith, Jackie Tyler (Camille Coduri) and, of course, an explanation (albeit a rather confusing one) for the recurring words "bad wolf". There are also more subtle allusions for long-term fans who might happen to spot them. The clear casing that houses the Emperor Dalek recalls the transparent shell of the Dalek leader in David Whitaker's novelisation of the first Dalek story. The Controller is reminiscent of both the Emperor Dalek in The Evil of the Daleks (being connected to cables) and the battle computer in Remembrance of the Daleks (a human female slaved to a computer during childhood). The Doctor's statement that he is going to: "wipe every last stinking Dalek out of the sky" echoes the vow made by the comic strip antihero Abslom Daak, to: "kill every damned, stinkin' Dalek in the galaxy!" The Emperor's final words, "I cannot die," were also Davros' last words in Resurrection of the Daleks, implying that the Emperor might contain a vestige of the Daleks' ancient creator, who set himself up as Emperor in Remembrance. It's just a pity that RTD stopped short of including the phrase "Ka Faraq Gatri", meaning "The Bringer of Darkness" or "Destroyer of Worlds", the term by which the Daleks are said to know the Doctor in several books and comic strips since Ben Aaronovitch's novelisation of Remembrance. Instead, the Doctor describes himself as "The Oncoming Storm", a title attributed by the Draconians in Paul Cornell's New Adventures novel Love and War. Still, I suppose that if "Ka Faraq Gatri" can be translated into two such different phrases, then it could also be taken to mean "The Oncoming Storm", since storms usually bring darkness. Either that, or the Doctor is mixing up his D monsters! Davies also seems a tad confused as to whether the Daleks are supposed to feel emotions or not. However, even their creator, Terry Nation, was prone to that failing - they have always exhibited hatred towards creatures unlike themselves, except in Destiny of the Daleks, where they are said to be emotionless and motivated solely by logic, rather like the Cybermen. Several other aspects of the plot also seem not to have been properly thought through. In Bad Wolf, it appears that the Doctor is responsible for millions, if not billions, of human deaths as a result of his interference a century earlier. Then Jack discovers that the game-show guns are not lethal but are in fact transmat devices. So that's all right then. However, The Parting of the Ways reveals that those teleported humans have been dissected and harvested, with selected cells being cultured into Daleks. So the Doctor is responsible for a massacre after all. Yet he seems remarkably chipper as he and Rose depart the station. And what about Captain Jack? We as viewers know that he has been resurrected, but as far as the Doctor and Rose are concerned he has been exterminated. So why aren't they in mourning for him? Come to that, why do they just leave in the TARDIS without at least searching for his body to confirm his fate? The sequence in which the Anne Droid takes on the Daleks is a hoot, but when you think about it, those Daleks haven't actually been killed, just transmatted to a Dalek ship. That is, unless Jack fitted the droid with a proper weapon beforehand. In any case, it puts the invaders out of action for a while at least. Talking of weapons, why does the TARDIS fly through space towards the mother ship, making itself a target for the Daleks' missiles, instead of simply materialising on board? Maybe the TARDIS needs to be at relatively close range before it can cunningly materialise around Rose, or perhaps the Doctor just wants to show off his ship's new force field. Come to that, why is the TARDIS dependent upon the extrapolator to generate a force field, when it is usually capable of producing an invulnerable field of its own. Maybe it was damaged by the Rift's energies in Boom Town. Some commentators have complained that the shows sent up in these two episodes would have been long since forgotten by the year 200,100. However, I feel it's well worthwhile to assume that there has been some kind of 21st-century retro revival, since the participation of Davina McCall, Anne Robinson, Trinny Woodall and Susannah Constantine in vocal roles, not to mention the authentic theme tunes to Big Brother and The Weakest Link, add up to a whole lot of fun. And finally, some critics were disappointed that RTD chose to have the Doctor explain what regeneration was before the process took place, rather than leave the transformation as more of a cliffhanger for new viewers. However, whereas viewers only had to wait one week to find out what had happened to the Doctor following his first metamorphosis at the end of The Tenth Planet, there was a gap of several months between The Parting of the Ways and David Tennant's first episode, The Christmas Invasion, so I think Davies got the balance just right. Tennant's first few seconds in the role are sufficiently exciting in their own right. At the end of the day, all the plot holes are easily forgotten in the excitement as this truly spectacular series finale unfolds. It may be flawed, but there's no denying it is great telly.